Concrete is becoming increasingly popular for interior home décor. From votive candle holders to table tops, this material is cost-effective, durable, and attractive. It’s especially suited for creating long-lasting countertops that withstand heat and the daily wear and tear of kitchens. The aggregates used in ready-mix concrete can be changed and swapped to suit any DIY concrete project, large or small, including countertops. Of course, these aggregates don’t just look good. They offer a wealth of benefits for every project. Here’s a look at the role aggregates play in concrete countertop mixes and how you can make your own concrete countertops. The ideal amount of cement used in a concrete mix depends on the size of the aggregates. Aggregates for concrete countertop mixes are smaller in surface area than for larger concrete projects—typically 3/8 inch to 5/8 inch. The cement in a concrete mix must coat the surfaces of all the aggregates. The smaller the aggregate particle, the more surface area per volume. This means more water is needed to wet the surface area. But too much water will lead to cement drying out, causing cracking, shrinking, and curling. To prevent the damaging effects of drying and shrinking, the size of the aggregates, along with the cement paste content and curing processes must always be considered. Concrete has a high compressive strength and a low tensile strength. It can withstand the weight of heavy objects, but it cannot withstand bending or flexing. To help prevent cracking, concrete countertops, like most concrete structures, need reinforcement. Fibre-reinforced concrete improves tensile strength and reduces the risk of cracking, especially for thinner slabs like countertops. These fibre reinforcements are often made of nylon, polypropylene, glass, or cellulose. And these fibre reinforcements can be added to your ready-mix concrete when ordered from a local supplier. A galvanized wire will also reinforce concrete, preventing it from cracking as it dries while adding strength. The quality of the mould you build will directly affect the appearance of your finished countertop. The size of your concrete countertop (and mould) will depend on the size of your existing countertop and/or base cabinets. If you’re measuring your base cabinets, add ¾ inch extra to the final measurement for overhang. Place a 4-ft by 6-ft piece of 1-inch thick melamine particle board on a pair of sawhorses. Measure the mould base and mark the exact dimensions on the particle board. Use a circular saw to cut the base dimensions. Then measure, mark, and cut four strips that are 2-¾-inches wide and 4-feet long. Drill 2-inch pilot holes every 6 inches along the strips. Using wood screws, attach two strips along the 4-foot sides of the base. Use wood screws to attach the other two strips along the remaining sides of the mould, trimming them first to fit. Use a square to check that the corners are even. For countertops that will hold sinks or cooktops, measure and mark the size of the hole you will need on the base of the mould. To cut out the hole, first drill pilot holes on the inside corners of this marked area. Cut from hole to hole along the edges of the marked area using a jigsaw. Measure and cut side pieces for the cut-out hole and attach them by butting them against the base from inside the cutout. Use wood screws to firmly attach these inner sides of the mould. Clean the mould thoroughly to remove any sawdust and dirt. Since the base of the mould will form the top of the countertop, it’s very important to not set concrete on any debris that could affect the appearance of the finished countertop. Using 100% silicone caulk, run a small uniform bead of caulk along the inner corners and seams of the mould. Carefully smooth out the caulk bead with a caulk tool and allow to dry for 24 hours. This silicone caulking will prevent freshly-poured concrete from leaking out of the mould. Since freshly-poured concrete is heavy, it can warp and bend the mould without proper support. You’ll need to build a support frame for the mould by measuring the mould and cutting 2x4s to frame the mould. Start by placing three boards that are longer than the mould beneat the mould. Attach the 2×4 end pieces to the bottom boards using 2-inch screws. Then attach the remaining two 2×4 side pieces to the end pieces using screws. The frame should be tight against the mould, but not attached to the mould. To reinforce the concrete countertop, use metal snips to cut a piece of galvanized structural stucco wire to the shape of the mould, being about one inch away from the edges of the mould on each side. Set this cut wire aside. For a 12-square-foot (3 feet x 4 feet) countertop, you will need three 60-lb bags of ready-mix concrete. Follow the manufacturer’s instructions and use a shovel to mix the concrete with water. This is the time to add pigment to the concrete if you want a coloured countertop. You can use liquid or powder pigment additives. While liquid pigments are easy to measure and mix, you must account for the water in the liquid as part of the total amount of water in the concrete mix. So be sure to follow the manufacturer’s instructions. Once the concrete reaches the texture of peanut butter, it’s ready to pour into the mould. Use a small bucket and a spade to pour the concrete into the mould. Press and compact the concrete into the mould as you go, until it fills the mould about halfway up the sides, or has a depth of 1 inch. Carefully set the wire into the concrete and make sure it doesn’t touch the mould. Then continue pouring the concrete to finish filling the mould, tamping with a trowel as you go to ensure it’s well compacted. Aim to slightly overfill the mould since the concrete will settle and drop. Smooth the surface with a trowel. And use an orbital sander without sandpaper to help the concrete settle. Hold the operating sander along the sides of the frame. The vibrations will bring air bubbles up to the surface of the concrete. Once the bubbles stop appearing, you can stop the vibrations. Cover the concrete with a plastic sheet or wet burlap for at least a week so it cures properly. Take apart the 2×4 frame. To remove the mould, drill two 2-inch screws halfway into the melamine sides and of equal distance apart. Do not drill all the way through. While holding the mould sides to the base with one hand, use the back of a hammer with the new screws to gently pry each side of the mould away from the concrete countertop. Take your time to avoid damage to your new countertop. With the help of a friend or two, flip the countertop over. Remove the cut-out sides using the same screw-hammer technique. Then remove the particleboard base. This should be easy to lift up. Finish the countertop using an orbital sander to buff away any imperfections along the surface and edges of the concrete slab. Be sure to wear a protective face mask or respirator and goggles so you are protected from all the dust. Start with a 100-grit sandpaper and work your way to finer grits, ending with a 220-grit sandpaper. Hold one hand on the countertop as you sand the edges. And be sure to sand evenly, checking the smoothness of the concrete with your hand. It will be done when each surface and edge is smooth. Wipe the concrete with a damp rag when finished. Wear eye protection, a respirator, and acid-proof gloves to etch the concrete surface with a solution of 1 ounce muriatic acid and 1 gallon of water. Wipe the solution over the concrete thoroughly with a sponge. If inside, open windows and doors for ventilation. Use clean water to rinse the acid solution off the slab and allow the concrete to dry thoroughly. Once dry, apply a concrete sealer to the countertop with a clean sponge or brush. Seal from one end to the other, using broad strokes. Once dry, apply a second coat of sealer, working at a right angle to the first coat. Repeat until the concrete won’t absorb any more sealer. Once the concrete has fully dried, you can install the countertop. Run a thick bead of silicone caulk along the top edges of the cabinet. Set the countertop in place, press down gently, and enjoy your brand new concrete countertop. To ensure you use the right concrete for the job, contact your local ready-mix concrete suppliers. 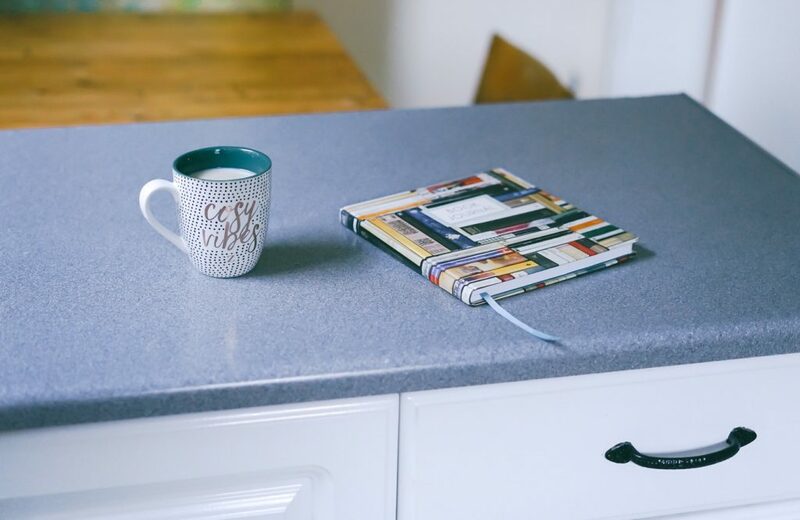 They can help you find a suitable concrete mix to create an attractive, durable, and long-lasting concrete for your DIY concrete countertop project.